说到Tarkut名师要属 Wat MaKhamThao 的Luang Phor Sook หลวงปู่ ศุข (Sook MaKhamThao) 了. 由于师傅的Tarkut年代久远..现在已经非常罕见了．其他著名的Tarkut名师有 Archan Nong (Wat SaiKow), Luang Phor Cham Long (Wat Chedi Deng), Luang Phor Kalong　(Wat KaoLaem), Luang Phor Tad, (Wat Chai Na), Luang Phor Thong 龙婆通　(Wat ShamPoChey), Luang Phor Koon 龙婆坤　(Wat Bahn Rai/Wat Ban Rai) and Lung Phor Pern　龙婆本 (Wat Bang Pra). Shown here is a red and black trakut from Luang Phor ChamLong, Wat Jedidaeng Ayuddhaya Province. Already encased in stainless steel casing. 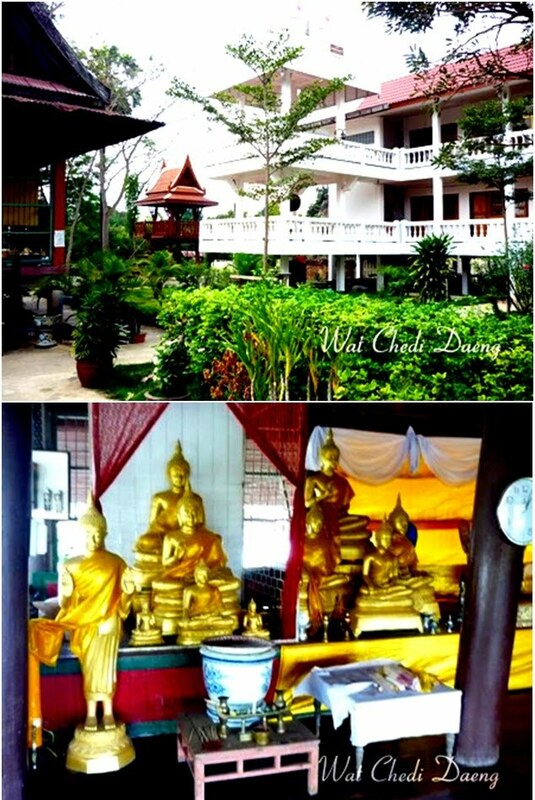 The highlight of old masters will bring us to Wat Chedi Daeng hidden in a small village in Ayutthaya. LP Chamlong is famous for his Takrut's supremacy for "kongkrapan" invulnerability and "metta mahaniyom" for loving affection. LP Chamlong is famous for his trademark in demonstrating the effectiveness of his "kongkrapan chatri" takrut by scratching a knife at the body of the wearer after handling over his takrut to the devotee. In earlier days LP Chamlong frequently accept local visitors and people seeking his miraculous takruts. At present LP Chamlong is physically weaker due to stroke he suffered and his old age. However, LP Chamlong never lack the prowness when performing holy water blessing to all devotees whether young or old. The holy water splashing is still very strong despite LP Chamlong's age and one will feel as though been pushed by a mysterious force when the water touches a person. 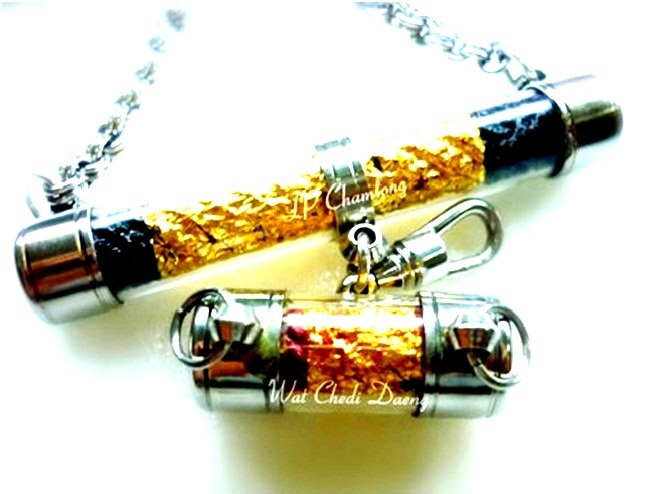 The 2 types of takrut is easily distinguised by the color; black wrapped with gold foil (for invulnerability) and red wrapped with gold foil (for loving affection). LP Chamlong also created hand made Phra Khun Paen. This limited Khun Paen amulet is 30 years old (B.E.2523) according to LP Chamlong and contained Plaai Guman powder. The design of this Phra Khun Paen amulet is represented by an image of Kumanthong sleeping at the bottom. Therefore, this image is most appropriate for weaering when having a negotiation or engaging in business joint-venture. In general, wearing Khun Paen image will bring unexpected good results due to the spiritual assistance from Kumanthong as depicted in the amulet. This is especially so if the image contains Plaai Guman activated power. In addition, Khun Paen has the enromous ability to provide blessings to usher wealth, decipher danger, and improving affinity with people to all who wear his image. Indeed this very rare and potent Phra Khun Paen amulet made by LP Chamlong is hard to come across. Not many people know that LP Chamlong also make Khun Paen amulets apart from his Takrut supremacy. The Phra Khun Paen amulet featured here is the last piece from Wat Chedi Daeng. At present, there are not many masters in Thailand who can make effective Plaai Guman powder. LP Chamlong's Phra Khun Paen is rarely seen by the public. We're very fortunate that this very rare piece was given the permission in this website by its owner whom is also NARESUAN THAI AMULET.BLOGSPOT.COM community member. In the early 90's throng of visitors visit Wat Chedi Daeng on daily basis to obtain the takrut and blessing from LP Chamlong. In those days LP Chamlong would personally give the black color takrut to devotees. 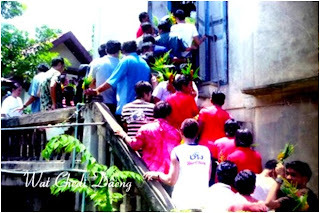 Most devotees would request LP Chamlong to test the "Kongkrapan Chatri" on their body. The devotee will hold the takrut on his palm after receiving it and place complete trust to the protective power of the takrut. 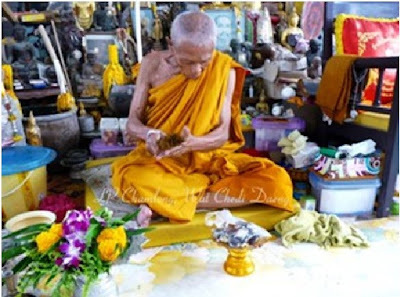 The testing procedure will begin with LP Chamlong reciting mantra and sprinkling "Nam Mon" or chanted holy water onto the back of the devotee. Once done, LP Chamlong would hold a very sharp knife which is more like a 12 inch length Meed Moh to tear the flesh of the devotee with all his energy. Tearing of the flesh with a knife by LP Chamlong may be brutal to witness on the scene. The above picture is a happy devotee whom had tested the sacred power of LP Chamlong's takrut without feeling any pain or whatsoever. The skin surface abrasion will normally heal in 1 or 2 days without any visible marks. 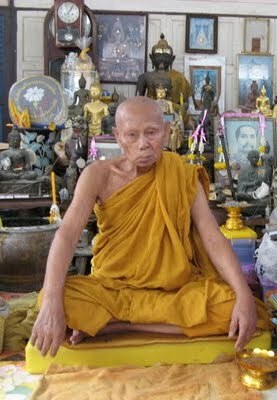 Today LP Chamlong do not perform this test ritual anymore due to his old age.